Boaz Atzili’s Good Fences, Bad Neighbors: Border Fixity and International Conflict explores the impact of the norm of border fixity that has arisen in world politics since 1945. He questions the view that a norm of border fixity reliably promotes peace; instead, he argues, the effect of the norm depends on conditions, and under today’s conditions the norm causes more war than peace. Boaz Atzili. Good Fences, Bad Neighbors: Border Fixity and International Conflict. Chicago: The University of Chicago Press, 2012. ISBN: 9780226031354 (cloth, $97.00); 9780226031361 (paper, $30.00); 9780226031378 (eBook, $7.00-$3.00). Specifically, Atzili contends that among strong states the norm causes peace by dampening conflicts over borders. But among weaker states it operates to preserve, expand and magnify state weakness; this state weakness then causes war. Weak states that would be selected out of the system–conquered–in a world without a border fixity norm survive and fester as failed states when a norm of border fixity prevails. Hence weak states proliferate and their weakness deepens into state failure. These weak and failed states then suffer internal war as they fall into anarchy. These internal wars then sometimes spread to become interstate wars, triggered by conflicts stemming from refugee flows, from aggressive action by diaspora groups, and from neighboring states’ political or economic predatory behavior toward the weak states. This war-spread is magnified by the norm of border fixity, which, by fostering state weakness, makes states less able to dampen the war-causing effects of refugee flows. A more violent world emerges. A norm of border fixity has usually been seen as a cause of peace. If borders can be changed by force, goes the argument, states will use force to impose their preferred borders on others, or use force preventively to preclude others from later imposing smaller borders on them. A norm of border fixity removes these dangers. Predator states are inhibited from taking predatory action by the norm, and their potential victims are reassured that they would not be attacked, thus calming them from taking preventive action. The delineation of borders becomes a settled question; and with borders being a ‘settle issue,’ a major source of contention is removed from the international scene. Warfare among states diminishes accordingly. This pro-border-fixity argument has a long heritage that traces back to the seventeenth century–to Hugo Grotius, the makers of the 1648 Peace of Westphalia, and the Westphalian international order that it spawned. The makers of the Westphalian order sought an antidote to the wars of religion that inflamed Europe during the sixteenth and seventeenth centuries. They believed that an answer lay in a stronger norm of respect for national sovereignty, including lesser-included norms of non-intervention and border fixity. Atzili contends that their remedy may have suited their age, but fails as a remedy in ours, because it fails in any age when weak or failed states are numerous. Since state weakness is widespread today–by one count one-third of states in today’s world are to some degree weak or failed–the norm of border fixity is now a net cause of conflict. The norm promotes peace in regions where states are fairly strong: North America, western and central Europe, East Asia, and South America. But it fosters war in regions where many states are weak: sub-Saharan Africa, the Middle East, the former Yugoslavia, Central Asia, parts of South Asia, and Central America. Together these regions of state weakness comprise large parts of the globe, hence the net impact of the norm of border fixity is now toward violence. The border fixity norm helped foster the widespread state weakness we see today; now it also interacts with that weakness to foster still more weakness, and war. To test his theory Atzili explores six cases: three from the era before the modern norm of border fixity arose (circa 1945): Brandenburg Prussia, Argentina, and Poland; and three from the era when the norm of border fixity prevailed (post 1945): Lebanon, Congo, and Israel. Atzili’s arguments are counter-intuitive, persuasive, and original. Atzili builds on the work of other scholars, including those who have noted and chronicled the rise of a norm of border fixity (such as Mark Zacher and Tanisha Fazal); those who have argued that international threats cause the development of strong states, and the absence of threats causes state weakness (such as Charles Tilly, Cameron Thies, Jeffrey Herbst and Miguel Centeno); and those who have explored the propensity of civil wars to spread across borders (such as Sarah Lischer, Idean Saleyhan, and Benjamin Miller). Atzili’s arguments depend heavily on their insights. In this way Atzili ‘stands on the shoulders of giants,’ in Isaac Newton’s phrase. Atzili uses their insights to fashion two arguments–that the norm of border fixity causes failed states, causing civil war, causing interstate war; and that the norm of border fixity, together with state failure, independently enhances the risk that civil conflicts will spread—that are new contributions. New theories are a rare thing in the International Relations (IR) field. Atzili has given us one. Atzili’s arguments have large implications for international law and for debates over foreign policy. The Westphalian norm of non-intervention has been challenged in recent decades on grounds that it allows human rights abuses by inhibiting international intervention to end them. Advocates of humanitarian intervention have argued for new international norms that leave wider room for humanitarian intervention. Atzili now offers a second reason to limit or put conditions on the norms of state sovereignty and non-intervention: they cause more war than peace. All debate over international norms, especially debate over the value of norms that protect international sovereignty, should take careful account of Atzili’s arguments and insights. Like all books, Atzili’s book is not above critique. Our four reviewers offer insightful criticism. Overall, three of our reviewers (Cameron Thies, Arie Kacowicz, and Dale Thomas) argue that Good Fences is an important contribution to the IR field. For example, Thomas concludes that “good books confirm your preconceptions, but great books challenge your intuitions and do so with solid evidence-based arguments. Good Fences, Bad Neighbors … is an example of a great book.” Hendrick Spruyt offers a more critical assessment, arguing that the book is solid but not very original. Readers can judge these arguments by reading the book for themselves. It will be time well spent. Boaz Atzili received his Ph.D. from the Massachusetts Institute of Technology and a B.A. in International Relations from Hebrew University in Jerusalem. He is an Assistant Professor in the School of International Service, American University. His interest is international security with an emphasis on territorial conflicts and the politics of borders, and the international aspects of state weakness and state failure. He has published articles in Studies in Conflict and Terrorism, SAIS Review of International Affairs, and International Security. Stephen Van Evera is Ford International Professor of Political Science at MIT and a member of the MIT security studies program. He holds a Ph.D. in political science from UC Berkeley. He is author of Causes of War: Power and the Roots of Conflict (Cornell University Press, 1999); Guide to Methods for Students of Political Science (Cornell University Press, 1997); and publications on American national security policy, American foreign policy, American grand strategy, the origins of the First World War, and nationalism and war. He is working on a project on religion and the causes of war. Arie M. Kacowicz is an Associate Professor in the Department of International Relations, Hebrew University of Jerusalem. His most recent publication will be Globalization and the Distribution of Wealth: The Latin American Experience, 1982-2008 (Cambridge University Press, forthcoming). His current areas of interest include multilateralism and global governance, international relations of Latin America, and borders in Latin America. Hendrik Spruyt is Norman Dwight Harris Professor of International Relations at Northwestern University, and Director of the Buffett Center for International and Comparative Studies. He received a Doctorandus from the Law Faculty at the University of Leiden (The Netherlands) in 1983, and his Ph.D. from the University of California, San Diego in 1991. He is the author of The Sovereign State and Its Competitors (Princeton University Press, 1994) which won the J. David Greenstone Prize for best book in History and Politics 1994-96. His book Ending Empire: Contested Sovereignty and Territorial Partition (Cornell University Press 2005) was a runner up for the Greenstone Prize in 2006. He is also the author of the textbook Global Horizons (University of Toronto, 2009) and.co-author with Alexander Cooley of Contracting States: Sovereign Transfers in International Relations (Princeton University Press, 2009). His research intersects comparative politics with international relations and focuses particularly on the formation of polities and their disintegration; and the rise and demise of territorial sovereignty. Cameron G. Thies is Professor and Chair of the Department of Political Science at the University of Iowa. His current research focuses on state building and state failure in the developing world, as well as the political economy of civil and interstate conflict more generally. He has published in journal outlets such as the American Journal of Political Science, Journal of Politics, World Politics, Comparative Political Studies, International Studies Quarterly, and European Journal of International Relations, among others. He is currently completing a book manuscript entitled Rulers, Rebels and Revenue: How Rivalries Shape State Building Efforts in the Developing World. Dale Thomas holds a Ph.D. in Political Science and specializes in the fields of event data analysis and geopolitics. He has taught at the University of Memphis and Arkansas State University for the past three years. Dr. Thomas is currently working on Parsing, Analysis, and Retrieval Systems for Event Data (PARSED), a project exploring the utility of refocusing analysis on natural language texts in order to geo-tag events, dynamically create new actor dictionaries, and allow multi-level actor representation and retrieval. He is also the founder and president of LGA Trading, Inc., a company that conducts short-term political risk analysis of investments affected by Middle East instabilities. The major argument advanced by this book is original and counter-intuitive. Atzili argues, following Jeffrey Herbst’s similar argument about African states, and Miguel Angel Centeno’s argument about Latin American states, that the norm of “border fixity” (territorial integrity, and the concomitant prohibition of violent territorial changes) might be conducive to the further weakening of weak, failed, and quasi states, especially in the Third World (Hypothesis # 2, pp. 45-49). Furthermore, the author argues, internal strife in weak states (partly as a result of the norm of border fixity) might exacerbate the spilling over of domestic conflicts (essentially civil wars) into international conflicts, thus resulting in “intermestic wars” and vulnerable polities susceptible to foreign interventions (52-54). In a nutshell, Atzili argues that “an international norm that promotes fixed borders is a source of many of today’s violent interstate and transnational conflicts” (3). Atzili’s argument is extremely interesting, original, and counter-intuitive, as well as important in both theoretical and practical terms. If Atzili is right, his arguments might carry important policy implications, even though they are revisionist and highly disturbing in character. Atzili seems to imply (in Hypothesis # 1, pp. 36-41) that we should prefer a more flexible and fluid world of changing and potentially expanding borders if we are interested in the evolution of socio-political stronger states. In other words, the very fixity and inflexibility of the current, post-World War II norm of border fixity (as corroborated also by the norm of uti possidetis, the recognition of previous colonial borders or the limitation of exercising self-determination within the previously recognized colonial borders without seceding) seems to entrap the new Third World states into fixed borders that lead to their further weakening. In methodological terms, Atzili has carefully crafted a method of structured-focused comparisons by posing two major cases of absence of border fixity (Brandenburg/Prussia in 1640-1740, and Argentina in the nineteenth century) in contrast to two more contemporary cases of the powerful presence of fixed borders (Congo since 1960 and Lebanon since 1950). In addition, Atzili artfully discusses two outlier (or “shadow”) cases, Poland-Lithuania, 1648-1795 and the Jewish Yishuv (pre-independence Israel) and Israel from 1920 to 1967. Hence, in his historical comparisons, Atzili takes us back almost four hundred years and spans several regions of the world in order to prove (more than disprove) his four theoretical hypotheses. I strongly recommend this book, especially to scholars and graduate students of Third World and international conflict and peace studies. Since it is well-written and the language is clear, it might also be useful as well for undergraduate students of international relations dealing with conflicts in the Third World. Like every significant book in the field, Atzili’s first significant opus (derived and adapted from his doctoral dissertation) is not exempt from contradictions and weak spots. I would agree with the author that even in our age of globalization, territoriality is still relevant. Yet, the question is to what extent territoriality (or better, “fixed borders”) might be blamed, nowadays, for the persistence of civil wars and the spillover of international conflicts? The author agrees (on page 18) that border fixity does not rule out the possibility of peaceful territorial change, though he recognizes violent territorial change as an aberration to the widespread norm of border fixity. Is that always the case? Is that always relevant or pertinent to discern domestic and international conflicts? Second, and even more important, I am still not completely convinced that border fixity has been the (or even a) major cause of the perpetuation and exacerbation of state weakness. In the introduction to the book Atzili adds his twist and focus upon the norm of border fixity to Charles Tilly’s famous statement about the relationship between war-making and state-making. As the book evolves and the fascinating historical cases unfold, it seems that Atzili is more interested in discerning the logic of the weak-strong state continuum than in assessing the implications of border fixity. In other words, as the author recognizes implicitly (on page 56) his book is after all more about the nature of state-society relations (strong and weak states) than about the norm of border fixity per se. As a matter of fact, after reading the book the reader gets the (probably correct) impressionthat the socio-political strength of the state is a more crucial explanatory variable than the norm of border fixity (or border fluidity, for that matter) in order to understand the logic of domestic and international conflicts in the Third World. Third, when Atzili analyses the consequences and implications of the spillover of domestic conflicts and civil wars, we learn about the relative relevance (or irrelevance) of border rigidity. After all, one can argue that if civil wars have spilled over in places like Lebanon or Congo since World War II, that means that borders have remained porous, permeable, and vulnerable, so that the norm of border fixity becomes quite irrelevant. Fourth, regarding the cases of the two countries that I am mostly familiar with, I would add a couple of empirical observations. Regarding Argentina, it is true that it did become stronger after 1880, but not necessarily as a result of territorial wars (except the “War against the Indians,” a genocidal campaign against native Argentines that could not be considered as an international war). The borders of Argentina were fluid, but paradoxically, Argentina shrank and did not expand, becoming a kind of revisionist actor, while adopting most of the time peaceful and legalist attitudes towards its borders (perhaps with the more recent exceptions of the Beagle Channel dispute with Chile that led to the verge of a war in 1978, and the actual and surrealistic confrontation with the United Kingdom over the Falklands/Malvinas in 1982). As for Israel, I would make the argument that it is not the case that Israel was less affected by the norm of border fixity. As a matter of fact, Israel has actually violated the norm of border fixity since the Six Day War in 1967, so that the political conflict with Syria and the Palestinians (and formerly with Jordan) has not been resolved yet. All in all, the book is perhaps less about borders and more about the weakness of states, which is perfectly fine, but this should be stressed more in the conclusions. At the end of the day, Atzili (like Holsti before him) pursues the very same policy question about the need to strengthen states in order to obtain peace, both within and among states (p. 221). Boaz Atzili provides a succinct and useful contribution to the bellicist theory of state formation, as well as to the literature on fragile states. The bellicist theory has been most commonly associated with Charles Tilly. However, the connections between European state formation and warfare have been noted by many others. The historical evidence of a close correlation between the emergence of modern warfare in the early Renaissance and the birth of increasingly centralized, high capacity states is strong indeed. Feudal armies traditionally had consisted of in-kind service of lesser lords and their armed retinues to superior lords and higher aristocracy. Such service was usually limited to forty days in the year after which the servitude had been fulfilled. Armies thus usually did not stand long in the field. Nor were such armies of great size, usually consisting of several thousand troops. Mounted cavalry warfare was an expensive proposition, with each mounted knight requiring hundreds of laborers to provide enough surplus to sustain him. By the thirteenth century the character of warfare had started to change. Organized commoners took to the field and defeated mounted aristocrats at Crecy, Courtrai and other battles. The archers of Agincourt were of course immortalized by Shakespeare’s Henry V, but the greater impact came from mercenary infantry in the fifteenth century. Gunpowder, used in artillery, shifted the balance even further against feudal warfare. In addition, larger, mercenary armies became the norm. If the French standing army at the end of the Hundred Years’ War numbered around 14,000, by the late sixteenth century the Spanish Empire and its adversaries could field armies ten times that size and more. This mode of warfare thus required increasing sums of money. No money, no Swiss, as the adage of the time held—with the Swiss mercenaries being the benchmark against which all infantry was measured. Money in turn required taxation and thus administration. Administration required routinization and rationalization of government, and so on. As the centuries progressed the monopoly over the means of warfare became the defining characteristic of the modern state. The bellicist theory of state formation is thus accepted by many scholars. Atzili is no exception. The threat to the existential existence of any given polity will lead to state formation, meaning the development of increased capacity, the ability to mobilize resources for war and increased legitimacy and social cohesiveness. Polities which fail to meet this pressure will be selected out—conquered and absorbed by stronger predators. The late twentieth century, specifically the norm of border fixity, has altered this logic. As scholars have noted, the norm of territorial sovereignty has been extended across the globe, with existing territorial borders becoming virtually immutable. Given this border fixity, argues Atzili, territorial challenges have become a thing of the past. Thus, weak states will not be selected out as they have been in the past. Instead, states that have inherited their borders by fiat rather than by a long term historical process of competition will continue to exist as weak states. Moreover, these weak states will become sources of internal conflict which often will spill over to their neighbors. Atzili thus places himself amidst a solid body of scholarship. But at the same time this also presents a problem. While he acknowledges the contributions of many other scholars who have looked at the connections between warfare and state formation he over-reaches when noting that “none of them present the comprehensive and coherent framework that I am striving to provide here. None has made the argument in its entirety as it appears here; none has connected the dots.” He criticizes the works of Tilly, Jeffrey Herbst, Miguel Centeno, Cameron Thies and others by noting they are limited in their historic and geographic attention. Yet others he criticizes for not making connections between weak states, internal conflict and external repercussions. But Centeno, Marcus Kurtz, Thies and others have explicitly gone beyond examining the European case, and they have covered broad swaths of history. Robert Jackson and Joel Migdal decades ago noted how the artificial nature of borders in the decolonized world relegated these states to juridical sovereignty while lacking de factor power. The link between such weak entities and internal conflict has been made abundantly clear by scholars such as Herbst, William Reno and others. The hypotheses that Atzili derives will surprise only those unfamiliar with this literature. And those familiar with these hypotheses will not be surprised to find them validated as many scholars have covered this terrain already. The author also misses an opportunity to perhaps add to the theoretical insights by strengthening our empirical knowledge. Instead, the book basically proceeds as a theory-confirming exercise rather than as an attempt to corroborate or falsify the validity of such well established hypotheses by examining a broader range of cases. The cases selected, by and large, cover ground well reviewed by others. Brandenburg-Prussia is the typical example of a militarized garrison state, the ‘Sparta of the north’ as Gordon Craig and Hans Rosenberg called it. Likewise, the contemporary case of Israel, as an example of a contemporary state that faces border challenges has been covered by Michael Barnett and others. The weakness of Congo and the external impact of its internal strife too will not be dramatic news to most readers. It is not that Atzili is wrong. It is simply that he confirms well established arguments rather than testing their limits and the conditions which might alter their causal implications. For example, he is aware of Brian Downing’s theory that mobilization for war need not always require centralization and internal balancing. Allies, geographic advantages and external resources will mitigate the need to mobilize domestic populations. What might be some of the contemporary cases that have benefited from such strategies and avoided a strong centralized state? One might also ask when and why internal conflicts tend to spill over. Atzili is aware of some of these variables, such as kinship and transnational insurgency, but we do not really see this argument developed through the analysis of a range of cases. Indeed, the hypotheses and the cases stack up very nicely, and raise the question of case selection. Given that the cases are relatively familiar, the hypotheses and the observations confirming the hypotheses appear easily matched. The book might have succeeded better by concentrating on the post-1945 period and holding some system level variables, such as the polarity of the system, the overall frequency of warfare in the system, and the superpower rivalry constant. While Atzili notes that variation over time allows him to vary the independent variable, border fixity, he could also have achieved this by studying post-1945 cases. As he shows, Israel could not take its territorial integrity for granted and thus built up a strong state, but Lebanon was assured of its territorial integrity, despite external influences. He could then test a larger number of cases to see under which conditions his hypotheses hold up and when they seem to have less explanatory power. Sometimes other variables seem to be doing a lot of the work. Why is it that external pressure on Lebanon and Congo was not perceived as a reason to rally around the flag? Instead, groups within these states welcomed external actors as leverage against domestic opponents. Here then it is not the border fixity norm that provides the key explanation for state weakness but rather the lack of an integrating mechanism which unites a society against external pressure. Or to put it in the terms of in-group versus out-group, why was the relevant referent group that threatened the polity not the external actor rather than the internal rival? This leads to the following more general question: why do some states build up larger state capacity under external pressure while others tend to fragment? In short, the book presents a welcome addition to the bellicist theory and similarly adds to the arguments, such as those of Jeffrey Herbst, that border fixity has impeded the development of weak states that gained their independence after 1945. Unfortunately though it misses some opportunities to engage in deepening our understanding regarding the mechanisms of when external pressures lead to state formation and when they do not. Territorial borders represent the foundational terrain of the discipline of International Relations (IR). Borders help to constitute our basic unit of analysis, the sovereign territorial state. Without territorially defined borders as conventionally understood, IR loses its privileged claim to explaining political relations in the interstate realm. Sovereignty, as we understand it today, would need revision in the absence or redefinition of borders based on territory. While many scholars have investigated conflicts rooted in contested territorial claims, it is surprising that so few in our discipline have interrogated the concept of the border itself. Atzili’s book is therefore a welcome addition to theorizing about one of the basic, taken for granted, concepts of IR. Borders also matter in the world outside of academic writing. One of the most troubling developments in the contemporary international system is the persistent weakness of the modern sovereign territorial state. The Cold War seemed to mask this weakness, as the two superpowers created their separate spheres of suzerainty supported with economic and military aid in exchange for loyalty. The cracks in system began almost immediately upon its demise: Kuwait was overrun in two days by Iraq in 1990 and Somalia collapsed within its own borders in 1991. Despite the fact that Kuwait and Iraq had experienced troubled relations since Kuwait’s independence, its borders were not adequately defended. In an earlier era, the conquest and annexation of Kuwait would likely have stood. Instead, and despite the lack of any alliance or security guarantee, a coalition led by the United States under United Nations auspices restored Kuwait to sovereign statehood. On the other hand, the global community’s intervention in Somalia ended in the first full-fledged collapse of a state in contemporary times. What is particularly instructive about Somalia is that no other state rushed in to claim its territory. “Somalia” today consists of the presidential palace, the airport and the ocean port. The remainder of Somalia’s territory consists of a variety of internationally unrecognized governance structures and many areas that exist in a state of anarchy. Both Kuwait and Somalia represent different facets of the border fixity norm identified by Atzili as strong states attempt to manage the global security consequences of fixed borders and weak states suffer through them. Atzili’s book is ideally situated to speak to the policy issues associated with both. There is much to commend about this book. While the “norm of border fixity” is not a new idea per se; having previously been described by Mark Zacher as a “norm of territorial integrity” and Tanisha Fazal as a “norm against conquest,” Atzili combines this norm with existing knowledge about the role of external threats in generating strong states. In particular, Atzili highlights the role of territorial threats in providing opportunities for rulers to reorganize the populations under their control via the development of military and civilian administrative structures designed to secure revenue in exchange for protection. This bellicist literature is also not new—what is new is the way in which Atzili artfully draws this existing knowledge together to generate some interesting predictions about how states in a fixed border world are likely to behave, as well as some of the consequences of that behavior. While I have worked in the same literatures that Atzili draws upon, his book impressed upon me the seriousness of fixed borders for theory and policy in a way that I had not previously considered. In the spirit of wishing to push this research agenda further, I offer the following critique for those who will pick up Atzili’s argument and approach and develop it even further. In terms of theory, the first three hypotheses seem to flow quite easily from the general argument that the socio-political strength of states is affected by the relative fixity of borders: a flexible borders’ world is likely to produce socio-politically stronger states, the border fixity norm is likely to perpetuate or exacerbate socio-political weakness in states, and weak states in a fixed border world are likely to suffer from internal violent conflict. I am less clear on why border-fixity makes the spillover of “internal” strife more likely than in a border-flexible world (Hypothesis 4). In a flexible border world, the ruler is constantly negotiating who is “internal” and who is “external.” Perhaps spillover of conflict is more directly observable in a fixed border world where boundaries neatly demarcate internal and external, but insurgency and kin-country mechanisms do not seem to be the exclusive domain of the fixed-border world. Hypothesis 5, which suggests that state weakness in a fixed border world invites non-territorial predation from outside actors, also seems somewhat ad hoc to the theoretical perspective. The wars that plagued the Democratic Republic of the Congo (DRC) beginning in 1996 seem to fit this ideal, as neighboring states joined in the plundering of the DRC’s natural resources. The other cases mentioned, including Syria’s interventions in Lebanon, do not fit my understanding of predation. As a result, while I found the evidence presented in Chapter 6 interesting in its own right, I did not necessarily see the evidence for Hypotheses 4 and 5 as connected directly to the theoretical argument presented in Chapter 1. Atzili’s methodological choices focus on the use of qualitative methods, which are very appropriate to the task at hand. Unfortunately, the book also includes a few misplaced dismissals of the usefulness of quantitative methods to study border fixity. I would suggest that both qualitative and quantitative methods are appropriate, either combined in one author’s mixed-method study or in contributions from multiple authors using methods that are their strong suit. Quantitative analyses of border fixity need not use the dyad-years format that “artificially inflates data that will be overly dependent on a small number of salient (and perhaps deviant) cases.” (5) My own statistical work on the effect of external threat on state fiscal capacity is monadic, including work on Africa cited as supporting evidence in this book. Quantitative researchers are aware of outliers and routinely check for them in their analyses. Instead of dismissing quantitative work, it might be useful for the author to revisit the two primary methods of qualitative analysis he draws upon in his book: structured focused comparison and process tracing. Alexander George’s work in attempting to systematize the case study to allow for theory generation and testing requires a great deal of self-consciousness in conducting research. The elements of these approaches are certainly present in the book, especially for structured focused comparison, but additional attention to the requirements of these approaches would have strengthened the case studies. Process tracing, in particular, requires a great deal of information about what Atzili calls “narratives” (27-28) or speech evidence that enables a scholar to connect manifest and latent events to people’s interpretations of them in order to identify the operation of a causal mechanism. I applaud the explicit attention to case selection, as well as the exploration of the preconditions of states selected for analysis. The common sense challenges to prevailing wisdom about the “uniqueness” of the arbitrary colonial borders and ethnic diversity facing contemporary states is refreshing. The author’s establishment of a ‘level playing field’ with regard to the preconditions for state building in Brandenburg-Prussia, Argentina, Lebanon and the DRC is one of the best features of the book. Let me briefly comment on questions that occurred to me as I read through the various cases and the evidence they present. The finding that Brandenburg-Prussia fits the argument about development in a flexible borders world is no surprise, since it is the archetype for a strong state. Argentina, on the other hand, is a puzzle to me (and to Atzili at first). Why didn’t Argentina grow into a socio-politically stronger state than it did in its flexible borders environment? Atzili’s response is that it faced lesser territorial threats than Brandenburg-Prussia. Atzili also draws upon the principle of uti possidetis—sovereign state borders should largely reflect inherited colonial borders, to reinforce the diminished territorial threats to Argentina. Argentina certainly faced repeated threats to its territory, and, in many fundamental ways, incorporated the threat of territorial losses into its sense of national identity. Argentina fought numerous wars and repeatedly engaged in territorial disputes with neighbors like Chile up through the 1980s. Yet Arie Kacowicz has also documented the development of norms of peace and security in the region, including Argentina in particular. So, does the Argentine case properly fit in the flexible borders world? It seems as though it must, given the threats Argentina faced, but the emergence of regional norms of accepted borders makes it a questionable case. I was even more puzzled by the conclusion that “Argentina’s significant success at state building, while more limited than that of Brandenburg-Prussia, could be attributed to a number of factors, such as geographic vastness and availability of financial tools to replace direct taxation” (110). The author had previously argued that geographic vastness, plus recourse to debt in lieu of direct taxation were sources of weakness. These many contradictions left me with more questions about Argentina’s fit with theory than answers. Future research should begin to probe some of the tantalizing questions raised in the conclusion. First, what effect does border fixity have on socio-politically strong states? Will strong states forged in a flexible border world become weaker in a fixed border world? Atzili offers some initial reflections using the Argentine and Israeli cases to suggest that they will weaken, but much more analysis is needed to arrive at any definitive conclusions. Second, how do strong states inhabiting regions constituted by strong states behave? Atzili refers to his own work to claim that in regions where states are strong “good fences do indeed make good neighbors.” (219) This claim seems to fit nicely with Arie Kacowicz’s arguments about the emergence of zones of negative/stable peace. Yet the two claims are at odds: if zones of stable peace emerge where strong states have settled their borders, then those states should become weaker, thus ultimately threatening regional peace and security. Third, the policy implications of the fixed border argument demand additional inquiry. Some of the implications may seem unpalatable, such as decertification and neo-trusteeship, but these and other remedies to weak states must be explored. If Atzili is correct about the effects of the border fixity norm, then the problem of weak states is not going away—in fact, it is only going to get worse. Finally, what are the implications of fixed borders for IR theory and the discipline of IR more generally? Will domestic factors be used to explain international outcomes, as they increasingly seem to be concerning the effects of regime type, the political survival of leaders, and so on? Will IR have any claim to its own disciplinary status, or will it be absorbed into comparisons of domestic politics? If borders are essentially fixed, then most of the behavior observed between states will be a function of purely domestic political processes. What will sovereignty mean if our usual distinction between juridical and empirical sovereignty increasingly defaults to solely juridical? Will interventions by strong states into weak states increase as norms like the responsibility-to-protect gain stature, or will they decrease as even strong states weakening in a fixed border world cling to the social construction of juridical sovereignty? The criticisms presented in this review are in no way meant to diminish the significance of this book. Indeed, Atzili has focused his analytical energies on one of the key underlying causes of many of the problems facing both weak and strong states in the international system: fixed borders. I hope that Atzili and others will continue to explore the theoretical and practical implications of this argument. This book is an excellent start to an exciting new research agenda. Good books confirm your preconceptions, but great books challenge your intuitions and do so with solid evidence-based arguments. 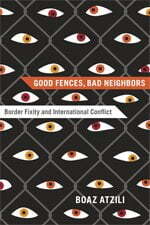 Good Fences, Bad Neighbors: Border Fixity and International Conflict is an example of a great book. The norm that borders should stand and not be revised by force has become increasingly entrenched in the post-World War II era. While the common understanding is that this norm promotes peace, Boaz Atzili argues that it perpetuates state weakness in the developing world. Moreover, Atzili suggests that this norm is an important source of civil conflict and helps explain the shift in international conflict from interstate conflict to intrastate conflict. Indeed, he says “the argument that an international norm that promotes fixed borders is a source of many of today’s violent interstate and transnational conflicts is the crux of this book” (3). Atzili’s carefully and thoughtfully researched book focuses on four main cases and uses what he terms two additional shadow cases. The four cases are Brandenburg-Prussia (1640-1740), Argentina (1810-1880), Lebanon (1950-2006), and the Democratic Republic of the Congo (1960-2006). The two shadow cases are Poland-Lithuania (1648-1795) and Israel (1920-1967). This is a qualitative case approach using “structured focused comparison” and “process tracing” (5). Through structured focused comparison the author uses a series of specific questions to approach the historical cases, and through process tracing the author examines the causal process and observes “congruities and divergences between the theory and the actual empirical process” (5). The author situates this work within the revived study of geopolitics and the renewed interest in the role of borders in international politics. A key component of the author’s argument is the role of territory as a stake in conflict and its role in state building. Citing authors such as Kalevi Holsti and John Vasquez, Atzili asserts that many if not most conflicts are about territory. Then, building on Friedrich Kratochwil, Mark Zacher, and Tanisha Fazal, the author lays out the principal of border fixity and demonstrates its acceptance as a major post-World War II international norm. Surprisingly absent though is any reference to the work of Harvey Starr, a major contributor to the study of borders and how the nature of borders conditions the effect of borders. As president-elect of the International Studies Association, past president of the Peace Science Society, and the major proponent for moving beyond conceptualizing borders and contiguity as simply present or absent, Starr has been a major player in reviving geopolitics in international relations. His exclusion is all the more noticeable because of the exceptionally well researched nature of Atzili’s book. Moreover, Atzili’s statement that “states have both the willingness (more reasons to fight) and opportunity (more tools to fight) for conflict initiation and war…” (11) uses the signature opportunity and willingness framework of Benjamin Most and Harvey Starr without mention of the authors. In order to assess the argument that border fixity leads to a perpetuation of weak states, Atzili must conceptualize state strength. For this purpose, he turns to the work of Joel Migdal, Barry Buzan, and Kalevi Holsti to create a definition of the sociopolitical strength of the state, which he defines “as the state’s capacity to maintain a monopoly over the legitimate use of force, its ability to rule effectively over its society (including extracting sufficient revenue and providing sufficient public goods), and its ability to maintain a reasonable level of social cohesiveness and identification of its residents with the state as such” (33). This definition anchors the structured focused comparison by providing six essential features that Atzili evaluates for each case to determine the strength of the six countries across the period in which they are considered. These features are: “(1) preservation of a monopoly over the use of legitimate force; (2) level of taxation and other means of revenue extraction; (3) efficiency and control of state bureaucracy; (4) reach and breadth of state institutions in areas such as law and education; (5) extent and spread (i.e., distance from center) of public spending and provision of goods; (6) cohesiveness of the society and level of identification of the residence with their state” (33). With these definitions in hand, Atzili argues that in a world of flexible borders two options are available to the leaders of states : they can engage in state building or ignore state building. If they engage in state building, a stronger state results. If however, by choice or constraints, they ignore state building, the state will either be further weakened or eliminated. Alternatively, in a world of border fixity, Atzili predicts a number of conditions including further state weakness, civil conflict, foreign predation, conflict spillover, and additional interstate conflict. This leads Atzili to assert and test five major hypotheses. Atzili’s first hypothesis is that “a world in which there is no normative prohibition on conquest and annexation is likely to result, over time, in socio-politically stronger states” (208). He clearly finds this to be supported by events in Brandenburg-Prussia during the 1640-1740 period. Brandenburg-Prussia went from being a relatively backwater and undistinguished German state to a highly efficient and strong state able to exert far greater influence in international affairs than its relative size and wealth would suggest. The case of Argentina only moderately supports hypothesis one, particularly because Argentina failed to develop its extractive capacity, bureaucracy, and the provision of public goods in the periphery. Atzili suggests that this could be due to the earlier acceptance of the border-fixity norm in South America. The ‘shadow case’ of Poland-Lithuania shows that the relationship captured by hypothesis one is non-deterministic. The Polish case largely coincides to the time period of that of Brandenburg-Prussia, but the results for the two states were dramatically different. The Polish leadership was unable to centralize the power of the state and found itself unable to meet the challenge of its international environment, which led to its demise. The second hypothesis is that “the border-fixity norm is likely to perpetuate or even exacerbate the weakness of already weak states” (208). To evaluate this hypothesis Atzili examines the cases of the Congo, Lebanon, and Israel. He finds that this hypothesis holds strongly for both the Congo and Lebanon, and he surprisingly argues that it also holds strongly for Israel, a state officially created in 1948. Arguably, Israel is the only major state to have experienced an existential threat during the first twenty-five years of the postwar era due to a rejection of its right to exist by its neighbors. Thus, Atzili finds that a strong Israeli state defies expectations because the case exhibits an exception to the norm of border fixity in the post-World War II period. Atzili’s third hypothesis is that “weak states in a world that embraces the border-fixity norm are rife with internal violent conflict because they create conditions favorable to ‘emerging anarchy’ and motivate the practice of ‘internal scapegoating’” (208). To evaluate this hypothesis, he once again turns to the cases of the Congo and Lebanon and finds that the hypothesis is strongly supported by both cases. Both the Democratic Republic of the Congo and Lebanon are states that have suffered from anarchical internal conditions as their respective governments have lacked either the resources or the will to impose social control. While internal scapegoating is not a major factor in Lebanon, Atzili argues that it does play a significant role in the Congo. Hypothesis four asserts “internal conflicts in weak states in a world that embraces the border-fixity norm tend to spillover and turn into international militarized conflicts through the mechanisms of transnational insurgency and kin-country syndrome” (208). The author considers the Congo and Lebanon cases to be strongly supportive of this hypothesis due to transnational insurgencies, as well as kin-country syndrome in the Congo. The final hypothesis is that “state weakness in a border-fixity world promotes the possibility of international conflict because it creates opportunities for external non-territorial predation” (208). Atzili finds that this is true for Lebanon and moderately so the case for the Democratic Republic of the Congo. Both Israel and Syria committed troops to Lebanon. Israel occupied southern Lebanon for a period of eighteen years before unilaterally withdrawing, while the Syrian military presence in Lebanon began in 1976 and continued through April 2005. However, neither state questioned the right of Lebanon to exist, nor did they attempt to annex Lebanese territory. This is a fascinating and well researched study into the possible unintended negative consequences of an otherwise positive norm. Atzili’s writing style is fluid, easy to read, and easily draws one into his argument. The forty pages of endnotes attest to Atzili’s care in crafting this manuscript and are an interesting read in their own right. The book also includes an extensive bibliography that is well-balanced across both the cases and the theoretical approach as well as an index. While perhaps a necessity given that the book is an initial exploration of an underlying causal dynamic, the emphasis on complementary rather than competing hypotheses calls into question the validity of the author’s assertion for a wider range of cases. Especially when confronted with ambiguous or missing information, analysts will typically adopt a favorite hypothesis and search out evidence that might support it. Disconfirming evidence is often ignored, relegated to the dustbin, or downplayed. As a result, intelligence analysis developed the ‘Analysis of Competing Hypotheses’ whereby each piece of evidence is evaluated as confirming or disconfirming a series of hypotheses. At the end of this process, the hypothesis with the least disconfirming evidence is chosen as the most likely explanation. Atzili’s argument seems to have merit, but one is left wondering whether or not a competing explanation exists that might better explain a wider range of cases. Border fixity is a norm, a social construction, much like sovereignty. The Westphalian model that characterizes the state as the highest political authority over a piece of territory has seldom worked in reality and was continually compromised by choice or imposition. Just as the Concert of Europe willingly violated the sovereignty of minor states when doing so maintained great power stability, border fixity itself is a malleable norm that will be violated by great powers when their interests are better served by doing so. The true question for all countries is control: how much control are governments able to exert over their nominal territories? Norms are constantly changing and ever evolving, but are, in the end, an expression of great power interests and understandings. As Thucydides so aptly noted in the Melian Dialogue, “You know as well as we do that right, as the world goes, is only in question between equals in power, while the strong do what they can and the weak suffer what they must.”  The norm of border fixity holds for now, but for how long is anyone’s guess. In summary, Boaz Atzili’s Good Fences, Bad Neighbors: Border Fixity and International Conflict is a great book worthy of one’s attention. The book should be of interest to international relations scholars, practitioners, and historians, all of whom Atzili’s book will remind of the law of unintended consequences. I am honored for my book to be reviewed in this H-Diplo/ISSF roundtable. I am even more honored that it has been reviewed by such a distinguished group of scholars – their own work has informed much of my thinking of this topic. I therefore would like to start by thanking both the H-Diplo editors and the reviewers for their time and the careful attention they devoted to Good Fences, Bad Neighbors. This book is an admittedly ambitious attempt to understand the effects of evolving norms of international borders on the process of state building and patterns of conflict, both internal and international. I argue that the norm that I call “border fixity” – that is the notion that (formal) international borders of existing states should stay fixed – has significant unintended consequences, which include the perpetuation of state weakness and the creation of an environment conducive to conflict in some parts of the world. The four reviewers offered praise, criticism, and insights that may add to future work on the topic. I will leave the praise to speak for itself and concentrate on the critiques and suggestions. It is hard to detect a general pattern in the critiques and questions the reviewers ask, since each has concentrated on one aspect of the project. Or perhaps this is the pattern: that each reviewer has found some portion of the complex argument I am making convincing, and other portions not as much. Let me then address the most salient points raised by the reviewers. Hendrik Spruyt’s review is perhaps the most critical of the four. His critique concentrates on two main points. The first is that while the book’s analysis might be accurate, there is not much new about it. Spruyt argues,” The hypotheses that Atzili derives will surprise only those unfamiliar with this literature. And those familiar with these hypotheses will not be surprised to find them validated as many scholars have covered this terrain already.” While this view seems not to be shared by the other reviewers (all of whom, I believe, are familiar with the relevant literature), it deserves a serious answer. I would submit that Spruyt’s argument stems from a misunderstanding of the claim of originality of the study. The intent of the book is not to innovate in any particular portion of what relates border fixity to international conflict (though I think it still does so in several places), but in making this connection itself. Good Fences makes use of the previous work of many scholars: political scientists, historians, geographers, and sociologists. This is how I see the endeavor of scholarship: not an individual attempt to invent the wheel, but rather standing on the shoulders of others to reach new heights. Thus, when I assert that no other work before this book has undertaken a similar task, I do not, by any stretch of the imagination, claim that all these works I rely on or cite are not worthy or useful. I merely point out that they strove to provide answers to other questions, or to explore other, often more narrow, areas (geographically or conceptually), and that this is how it should be. What I have tried to achieve in this book, however, is to connect the dots in a different way. To relate, in other words, the great work that has been done, from Charles Tilly, Miguel Centeno, Cameron Thies, and others on the ‘bellicist theory,’ to the excellent though incipient literature on border fixity (by Mark Zacher and Tanisha Fazal), along with the literature on the relationship between state weakness and international conflict (by Benjamin Miller, K.J. Holsti, Idean Salehyan, and others). Here is the crux of my claim of originality. As Thies sees it, “What is new is the way in which Atzili artfully draws this existing knowledge together to generate some interesting predictions about how states in a fixed border world are likely to behave, as well as some of the consequences of that behavior.” Instead of inventing the wheel, then, I hope that the originality of this work is mainly in transforming the pre-made wheels, together with the chassis, the engine, and a few other components into a new and useful vehicle. Spruyt’s second main point is that the book does not really tell us when external pressure will result in a healthy process of state building and when it will not. Indeed, these are worthy questions that we should address thoroughly. But Good Fences does address these to a significant degree. First, it argues that external pressure is much more likely to result in the strengthening of states when this pressure is about redrawing the state’s formal borders. Indeed, that is part of what differentiates my argument from most other works in the bellicist tradition. Tilly, Brian Downing, and others look at external pressure in general, while I maintain that only when such pressure concerns borders is it likely to significantly change incentives in such a way as to produce strong states. This is also the crux of my answer to Arie Kacowicz’s suggestion that perhaps the permeability of borders in much of the developing world shows that border fixity might not be a strong norm after all. Yet, as my cases of Lebanon and the Congo clearly reveal, the permeability of borders there, as elsewhere, is not contradictory to border fixity. The foreign troops that occupied and controlled both countries did not change their official borders or annex any part of their territory. And that, exactly, is why these external invasions did not result over time in stronger Lebanese and Congolese states, nor in a more cohesive Lebanese or Congolese national identity. In other words, this is a specification of conditions under which external pressure is more or less likely to produce stronger states. Not that I think this is the end of the road for this inquiry. On the contrary, given the fact that the theory is not deterministic (as is shown, e.g., by the Poland-Lithuania case), one should strive to refine and further specify our understanding of the scope of conditions under which one would expect a more or less successful projects of state building to ensue, even beyond the norm of border fixity. This is sound advice. One potentially fruitful avenue for research, as Thies notes, is the quality of leadership. Even when the structural cards are set against a state, excellent leadership can sometimes mitigate these structural conditions. And there may be other condition one could identify, some of which I hope to address in my current work. A wholly different question is that of violent cross-border spillover. As indicated on pages 52-56, in Figure 4, and in the case studies of Congo and Lebanon, I argue that in regions in which most states are socio-politically weak, internal conflicts are much more likely to expand across international boundaries. Thies presents a challenge to this theory. While he believes Good Fences makes a strong case to support the relations between border fixity and the perpetuation of state weakness, as well as the relations between state weakness and civil conflict, he was not convinced by the claim that the combination of weak states in a fixed-borders world leads to more frequent spillover of internal strife. Kacowicz, meanwhile, does not questioning the spillover itself but the role the border fixity norm is playing in it. Indeed, as Kacowicz notes, the socio-political strength of the state is “doing much of the work” in this spillover of violence, and many of the reasons why weak states are a source of cross-border violence are evident even without border fixity. For instance, the lack of ability to prevent armed refugees from attacking the government of their homeland and thus generating retaliation and sometimes invasion, is not directly a result of border fixity. Nor is cross-border kin intervention. Yet, the fact that border fixity provides states with the ‘insurance’ against the ultimate threat in international relations – the threat to the state’s survival – provides states with disincentives to resolve either of these problems. Both the monopolization of the means of violence and a political-social-economic policy that stresses inclusive national identity formation are costly endeavors, which leaders often prefer to avoid if they can. Border fixity provides them with the ability to avoid such measures of state building and thus increases the chances that internal strife within weak states will spill across borders. A comparison between Rwandan refugees in the Zaire/DRC and Tanzania is instructive: in the former, an extremely weak state, the mostly Hutu refugees of the Rwandan genocide were able to arm and to use the camps as a staging ground for attacks inside Rwanda. Border fixity enabled the Mobutu regime, and later on that of Kabila, to act recklessly vis-à-vis their neighbors, while state weakness limited their capacity to act. The results (though much more complicated, as the book shows) were two invasions and an ongoing conflict, which cost the lives of millions. In Tanzania, a stronger – though still not “strong” – state, the results were starkly different: the army and police kept the Hutu camps mostly free of arms, and did not allow cross-border raids. Therefore Tanzania had no international conflicts with its Rwandan neighbor. And ultimately, because border fixity perpetuates state weakness, it creates the basic conditions that enable many of the world’s states to stay weak and therefore also increases the chances of conflict spillover. As Thies notes, one is hard-pressed to explain the persistence of Somalia, a constant source of cross-border conflict spillover for decades, without resorting to the border fixity norm. So yes, state weakness does do much of ‘the work.’ But states would have likely been less weak and fewer weak states would have survived without border fixity. It is hard to imagine the Congo (DRC), for instance, surviving in its pre-war borders (or at all) before border fixity. Thomas raises an even more fundamental question. As he asserts that “norms are constantly changing and ever evolving, but are, in the end, an expression of great power interests and understanding,” he asks whether the border fixity norm is not merely an ephemeral phenomenon that is likely to change in tandem with shifts in the global balance of power. I argue it is not. In my mind, norms are indeed given to changes over time, but strong international norms can be – and border fixity is – something that is much more than an epiphenomenon of great powers’ interests. As I discussed in Chapter 1, great powers’ interests may have played a role in the development of the norm, but so have other important ideational and material factors. However, once the norm is accepted, institutionalized, and practiced, it can take on a life of its own. As I do not see state interests as fixed and objective, I think that the norm of border fixity in fact shapes the way many states – great powers included – define their interests. This does not mean that it will never change, because it will. Yet this change is unlikely to be simply a result of change in a great power’s interests. With this deliberation, though, we are entering the realm of the perennial debate about the independent status and powers of norms and ideas. This debate started long ago and unfortunately, is unlikely to be resolved here. I want to turn now to the reviewers’ questions about the cases. In terms of case selection, Spruyt voices the concern that the book takes a well-trodden path in this selection rather than exploring new cases. Several factors led me to choose the cases I did. For one, I wanted to choose cases that were all weak at ‘the outset,’ so that I would still be able to compare them, despite the obvious differences, across time and space. Chapter 3 of the book makes the case for the justification for such a comparison and establishes a more or less ‘level playing field’ for it. Second, I wanted to choose cases that would have enough existing material, primary but mainly secondary, to rely upon. Ideally, I would have liked to have explored cases that were never discussed in the literature before and to reveal great truths about them. Yet, in the real world one needs to make some trade-offs. Choosing to spread my cases across four hundred years and four continents meant that I would have to look at some well-studied cases. Yet, I think that Good Fences does take a fresh look at even the most studied case of Brandenburg-Prussia, by looking at it from the perspective of territorial threats and opportunities, or lack thereof. And the other cases are not as much discussed in the literature as Prussia. There is much descriptive material about Congo’s and Lebanon’s wars, for instance, but few analytical studies in the context of state building and its relations to conflict. Spruyt suggests that I could have concentrated instead on a more thorough exploration of the post-1945 period. In fact, that was my intention when starting to work on this project. Yet, this approach presented a serious problem: if, as I argue, border fixity is almost universally accepted in this period, I would end up with very little variation on the independent variable, that is, norms of borders. Indeed, the case of Israel is one of very few cases that one may argue was not subjected to the border fixity norm (Taiwan may be another, on some level). Hence my choice of a long-term and geographically-spread set of cases. Let me now turn to two of the cases, these of Argentina and Israel, which are directly referred to in some of the reviews. First, since both Kacowicz and Thies question the fit of nineteenth century Argentina within the framework of flexible borders and state strengthening, this case needs clarification. Indeed, as I admit in the book, Argentina is not a simple case and not an easy fit. For analytical purposes I felt compelled to create in the book a dichotomous framework in which the border fixity norm either existed or did not exist. But nineteen-century Argentina is a much more complex place – one in which early manifestations of the border fixity principle were indeed starting to appear. The utis possidetis principle, discussed best in Kacowicz’s own book, began to have a real effect in the continent in the second part of the 1800s. That effect created in late nineteen-century South America an environment which was neither that of traditional flexible borders nor yet one of border fixity. But it would also be, I think, not correct to paint a picture in which Argentina faced little territorial pressure. The Argentine story can be seen as either a tale of territorial losses and shrinkage (as it perceived by many Argentines), or one of territorial expansion from a small core in Buenos Aires, if one looks at the actual control and not the nominal borders. Either way, a fairly strong territorial pressure is a significant factor in this picture. In terms of state building as well, Argentina is a complex case in many senses. Compared to its former self, by the 1880s it was certainly a much stronger state according to the most relevant measure. It was more centralized (though federal), possessed a reasonable degree of monopoly over the use of force, and its state institutions were much broader and more effective than at any time since independence. Yet, the capacity of the state was still limited and its reach partial, if one compares it to a strong European state of the era, for example. Thus Argentina presents only a partial fit to the dichotomous model of border fixity and state strength of the book. Yet, as I discuss in pages 110-111 and 208-210, this result is in fact an affirmation of the broader logic of my argument: the less flexible the borders (or the stronger the border fixity norm), the harder it is to build strong states. Incipient ideas of border fixity in Argentina, then, created less territorial pressures than an environment of flexible borders (as in, e.g., seventeen century Europe) and therefore resulted in a state that was stronger than its former self yet not as strong as it would otherwise be. Israel is another complex case. It was born to a world on the verge of adopting the border fixity norm, but its pre-state history and its first twenty years as a state are an exception to this rule. In the time examined in the book (pre-state to 1967), neither Israel’s borders nor its mere legitimate existence as a state were recognized by its neighbors. Given the legal limbo of the territory of the former British Mandate of Palestine, Israel’s leaders themselves sometimes contemplated expansion (and tried it in 1956 only to be rebuffed by the great powers). Yet, Kacowicz is indeed right to note that the border fixity norm has been affecting Israel since 1967, and that the violation of this norm is a major reason for the long stalemate between Israel and some of its neighbors. I would submit, moreover, that this is exactly the reason why any territorial solution that will not be based on the 1967 border is unlikely to gain international (and regional) legitimacy. Asserting so does not contradict the book’s findings in the case study of Israel though, since the period of study is only until 1967. Border fixity evolved and strengthened overtime. In 1948, when Israel annexed some of the territories allotted by the UN to the Arab (Palestinian) state, the norm was still in its infancy and Israel’s new borders were recognized by many states. Its 1967 conquests, on the other hand, were never recognized by a single country outside of Israel, because in the interim two decades, as is documented in the book, border fixity gained a strong foothold as an international principle and practice. These interim twenty years of territorial threats and opportunities were sufficient, nevertheless, to produce a strong state in Israel. All the reviewers also have some very helpful suggestions that can benefit our contemplation of the path of future research on borders, state building, conflict, and their mutual relations. Spruyt’s general suggestion that the research should advance in the direction of delineating the conditions under which states will benefit from external pressure, and those in which they will not, is well taken. I engaged this query in this book with the broad proposition that territorial pressure creates different incentives and constraints than non-territorial ones. Yet, much more work is indeed needed in order to study the nuances of this supposition, as well as other potential variables at play here. Kacowicz suggests that the place of peaceful territorial changes within the border fixity norm is not sufficiently clear in this book. I concur that this is a potentially fruitful path for future research. Thomas points to the omission of the work of Harvey Starr, which I intend to take to heart in my future explorations of the topic as well. Thies suggests two important points. First, that in the study of relations between borders, conflict, and the state, qualitative and quantitative methods are complementary rather than competing, and both should be put to a good use. I agree whole-heartedly, and regret it if my defense of comparative and case analysis in the introduction to Good Fences may have been interpreted as an attack on the statistical method. Given existing data and the task of the book, a qualitative approach was more appropriate in my mind, but that should not be read as belittling the need to use any methodology in our toolkit to advance the knowledge of international relations. Excellent quantitative research on external conflict and state building, and on state weakness and conflict spillover, for instance, contributes important insights and evidence to my study. Second, Thies suggests that how the question of border fixity norm affects strong state is an intriguing one. While this question is beyond the limits of this book, it is indeed a great question worthy of exploration. My hunch is that border fixity in fact does not much weaken states that have already been strong at the time of change in border norms. In a sense, a certain threshold exists beyond which the state bureaucracy and its legitimacy are much less vulnerable to the potential corrosive effects of border fixity. Yet, this is certainly a question that needs to be studied carefully in future research. Lastly, I want to address the question of the implications of the border fixity argument. Kacowicz describes it as revisionist theory, but I do not agree. Readers may refer to the book (218-221) for a longer discussion, but suffice it to say here that I do not think that a wholesale opening up of the border fixity principle is either likely or preferable. For one thing, strongly engrained international norms are not easily manipulated, and what took generations to blossom may not be nicked with a simple action of an individual or even a state or an international institution. Border fixity is here to stay for the long term. And that may not be a bad thing. The book concentrated on the negative unintended effects of the norm, but border fixity also has positive consequences (though mainly for strong states), and without a careful weighing of the alternatives, one should not easily jump to operational conclusions. What I hope this book does (and what these reviews certainly do) is open a rigorous discussion of what it means to have fixed borders. The fact that a question has no easy answers does not mean we need to avoid it. Future research should— and I believe will— get closer to finding some of these answers. Mark W. Zacher, “The Territorial Integrity Norm: International Boundaries and the Use of Force,” International Organization 55, No. 2 (Spring 2001): 215-250; Tanisha M. Fazal, State Death: The Politics and Geography of Conquest, Occupation, and Annexation (Princeton: Princeton University Press, 2007). Charles Tilly, “Reflections on the History of European State-Making,” in The Formation of National States in Western Europe, ed. Charles Tilly (Princeton: Princeton University Press, 1975); Cameron G. Thies, “State Building, Interstate and Intrastate Rivalry: A Study of Post-Colonial Developing Countries Extractive Efforts, 1975-2000,” International Studies Quarterly 48 (2004): 53-72; Jeffrey I. Herbst, “War and State in Africa,” International Security 14, no. 4 (1990): 117-39; Miguel A. Centeno, Blood and Debt: War and the Nation-State in Latin America (University Park, Pennsylvania: Pennsylvania University Press, 2002). Sarah K. Lischer, Dangerous Sanctuaries: Refugee Camps, Civil War, and the Dilemmas of Humanitarian Aid (Ithaca: Cornell University Press, 2005); Idean Salehyan, Rebels without Borders: Transnational Insurgencies in World Politics (Ithaca: Cornell University Press, 2009); Benjamin Miller, States, Nations, and the Great Powers: The Sources of Regional War and Peace (Cambridge, UK: Cambridge University Press, 2007). See Kalevi Holsti (1996), The State, War, and the State of War (New York: Cambridge University Press); Benjamin Miller (2007), States, Nations, and Great Powers: The Sources of Regional War and Peace (Cambridge: Cambridge U|niversity Press), Arie M. Kacowicz (1994), Peaceful Territorial Change (Columbia, SC: University of South Carolina Press), Arie M. Kacowicz (1998), Zones of Peace in the Third World: South America and West Africa in Comparative Perspective (Albany: State University of New York Press), and Arie M. Kacowicz (2005), The Impact of Norms in International Society: The Latin American Experience, 1881-2001 (Notre Dame, IN: University of Notre Dame Press). See Jeffrey Herbst (1989), “The Creation and Maintenance of National Boundaries in Africa,” International Organization 43. No. 4, pp. 673-692. See Miguel Angel Centeno (2002), Blood and Debt: War and the Nation-State in Latin America (University Park: Pennsylvania University Press). See Charles Tilly (1985) , “War Making and State Making as Organized Crime,” in Peter Evans, Dietrich Rueschemeyer and Theda Skocpol, eds., Bringing the State Back In (Cambridge: Cambridge University Press), pp. 169-191. Charles Tilly, “War making and State making as Organized Crime,” in Peter Evans, Dietrich Rueschemeyer and Theda Skocpol, eds. Bringing the State Back In (Cambridge: Cambridge University Press, 1985); Charles Tilly, Coercion, Capital and European States, AD 990-1990 (Cambridge: Basil Blackwell, 1990). Edward Ames and Richard Rapp, “The Birth and Death of Taxes: A Hypothesis,” Journal of Economic History, vol.37 (1977):161-178; Richard Bean, “War and the Birth of the Nation State,” Journal of Economic History vol. 33, no.1 (1973): 203-221; John Brewer, The Sinews of Power (New York: Alfred Knopf, 1989). Marc Bloch, Feudal Society, 2 vols. (Chicago: University of Chicago Press, 1961). Atzili phrases this in terms of several hypotheses. Boaz Atzili, Good Fences, Bad Neighbors: Border Fixity and International Conflict (Chicago: University of Chicago Press, 2012), 36, 37, 208. Tanisha Fazal, State Death. (Princeton: Princeton University Press, 2007); Mark Zacher, “The Territorial Integrity Norm: International Boundaries and the Use of Force,” International Organization vol. 55, no.2 (2001): 215-50. Miguel Centeno, Blood and Debt: War and the Nation-State in Latin America (University Park: Penn State University Press, 2002); Marcus Kurtz, “The Social Foundations of Institutional Order: Reconsidering War and the ‘Resource Curse’ in Third World State Building,” Politics and Society vol. 37, no. 4, (2009):479-520; Cameron Thies, “War, Rivalry and State Building in Latin America,” American Journal of Political Science vol. 49, no.3 (2005):451-465. Robert Jackson, “Quasi States, Dual Regimes, and Neo- Classical Theory: International Jurisprudence and the Third World,” International Organization vol. 41, no.4 (1987): 519-549; Joel Migdal Strong Societies and Weak States (Princeton: Princeton University Press, 1988). Jeffrey Herbst, “War and the State in Africa,” International Security vol. 14, no.4 (1990):117-139; Jeffrey Herbst, States and Power in Africa (Princeton: Princeton University Press, 2000); William Reno, Warlord Politics and African States (Boulder, CO.: Lynne Rienner 1998). Brian Downing, The Military Revolution and Political Change (Princeton: Princeton University Press, 1992). Mark W. Zacher, “The Territorial Integrity Norm: International Boundaries and the Use of Force,” International Organization 55, no. 2 (2001); Tanisha M. Fazal, State Death: The Politics and Geography of Conquest, Occupation, and Annexation (Princeton, NJ: Princeton University Press, 2007). Hendrik Spruyt, “The Origins, Development, and Possible Decline of the Modern State,” Annual Review of Political Science 5 (2002): 127-149. This claim is also reiterated on page 39. Cameron G. Thies, “National Design and State Building in Sub-Saharan Africa,” World Politics 61, no. 4 (2009): 623-69; Cameron G. Thies, “State Building, Interstate and Intrastate Rivalry: A Study of Post-Colonial Developing Countries Extractive Efforts, 1975-2000,” International Studies Quarterly 48 (2004): 53-72. Alexander L. George and Andrew Bennett, Case Studies and Theory Development in the Social Sciences (Cambridge, MA: MIT Press, 2005). Cameron G. Thies. Territorial Nationalism in Spatial Rivalries: An Institutionalist Account of the Argentine-Chilean Rivalry. International Interactions 27, no. 4 (2001): 399-431. Arie M. Kacowicz, The Impact of Norms in International Society: The Latin American Experience, 1881-2001, (Notre Dame, IN: University of Notre Dame Press, 2005). Robert I. Rotberg, Ed. When States Fail : Causes and Consequences (Princeton, NJ: Princeton University Press, 2004). Arie M. Kacowicz. Zones of Peace in the Third World: South America and West Africa in Comparative Perspective (Albany, NY: SUNY Press). Kalevi J. Holsti, _Peace and War: Armed Conflict and International Order 1648-1989_ (New York: Cambridge University Press, 1991); John Vasquez, The War Puzzle (New York: Cambridge University Press, 1993). Friedrich Kratochwil, “Of Systems, Boundaries, and Territoriality: An Inquiry into the Formation of the State System,” World Politics 39 (1986): 27-52; Mark W. Zacher, “The Territorial Integrity Norm: International Boundaries and the Use of Force,” International Organization 55.2 (2001): 215-250; Tanisha Fazal, “The Origins and Implications of the Territorial Sovereignty Norm,” Paper presented at the annual convention of the American Political Science Association. San Francisco, August-September 2001. See for example, Harvey Starr, “Using Geographic Information Systems to Revist Enduring Rivalries: The Case of Israel,” Geopolitics 5.1 (2001): 37-56; Harvey Starr, “Opportunity, Willingness and Geographic Information Systems: Reconceptualizing Borders in International Relations,” Political Geography 21 (2002): 243-256. Benjamin A. Most and Harvey Starr, Inquiry, Logic and International Politics (Columbia, SC: University of South Carolina Press, 1989). Joel S. Migdal, _Strong Societies and Weak States: State-Society Relations and State Capabilities in the Third World_ (Princeton, NJ: Princeton University Press, 1988); Barry Buzan, People, State, and Fear: An Agenda for International Security Studies in the Post Cold War Era (Boulder, CO: Lynn Rienner, 1991); Kalevi J. Holsti, The State, War, and the State of War (New York: Cambridge University Press, 1996). Stephen Krasner, “Compromising Westphalia,” International Security 20:3 (1995/1996): 115-151. Samuel Barkin and Bruce Cronin, “The State and the Nation: Changing Norms and the Rules of Sovereignty in International Relations,” International Organizations 48:1 (1994): 107-130. Thucydides, The Peloponessian War (New York: Random House, 1951). E.g., Charles Tilly, Coercion, Capital, and European States, AD 990-1992. Cambridge, Massachusetts: Blackwell, 1992; Miguel A. Centeno, Blood and Debt: War and the Nation-State in Latin America (University Park, Pennsylvania: Pennsylvania University Press, 2002); Cameron G. Thies, “State Building, Interstate and Intrastate Rivalry: A Study of Post-Colonial Developing Countries Extractive Efforts, 1975-2000,” International Studies Quarterly 48 (2004): 53-72. Mark W. Zacher, “The Territorial Integrity Norm: International Boundaries and the Use of Force.” International Organization 55, No. 2 (Spring 2001), pp.215-250; Tanisha M. Fazal, State Death: The Politics and Geography of Conquest, Occupation, and Annexation (Princeton: Princeton University Press, 2007). Benjamin Miller, States, Nations, and the Great Powers: The Sources of Regional War and Peace (Cambridge, UK: Cambridge University Press, 2007); Kalevi J., Holsti, The State, War, and the State of War (New York: Cambridge University Press, 1996); Idean Salehyan, Rebels without Borders: Transnational Insurgencies in World Politics (Itacha: Cornell University Press, 2009). Brian M. Downing, The Military Revolution and Political Change: Origins of Democracy and Autocracy in Early Modern Europe (Princeton: Princeton University Press, 1992). The principle that borders should reflect those of the pre-existing colonial lines. Arie M. Kacowictz, The Impact of Norms in International Society: The Latin American Experience, 1881-2001. (Notre Dame, Indiana: University of Notre Dame Press, 2005).